More great new stuff, (and a bit of legitimate vintage, too) created with a feel for comics of “the good old days”. 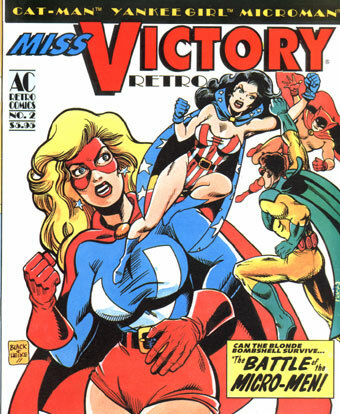 Among some of comics first female costumed superheroines along with Phantom Lady and Black Cat in Aug of ’41(yes, she beat Wonder Woman by some months) gets the star treatment this issue, as the future leader of the Femforce, Miss Victory takes on The Vulture, in a size-changing soire set in the 1940’s, and titled “Battle Of The Micro Men” It is written and layed out by Bill Black, with finished art by David Jacob Beckett. It guest stars Yankee Girl, Cat-Man and Kitten, and Microman. Then, it’s actual great Golden Age reprints the rest of the way, starting with Miss Victory battling Axis spies in Washington, in an untitled story from Holyoke comic’s Captain Aero Comics #7, from July of 1942. It’s drawn by Charles Quinlan. Then, it’s another actual story from the past, with some treaking. AC Comic’s diminutive super-guy revived from the Vault Of Heroes, is known as Microman. That character, under THAT NAME, didn’t really exist in the Golden Age, so we’ve taken a real G. A. story,(we won’t tell you WHO the tiny character was originally, but he’s real handsome. Some people might even call him a doll…) altered the lead guy’s costume a bit. and voila- Microman. Anyway, the story is called “Formula For Fear”, and it really ids from 1951. Oh, this issue also has the entries in the “Design A New Costume For Young Mystic Man Costume” contest, too.